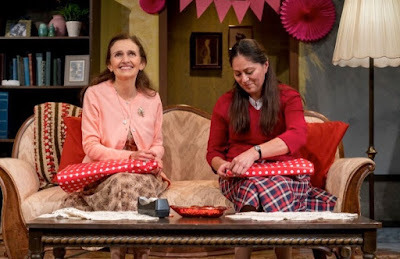 Carol's Theatre Reviews ~ It's Fun To Go Out: Moxie’s “The Madres” Opens Another Door Into ‘Man’s Inhumanity Toward Man’. 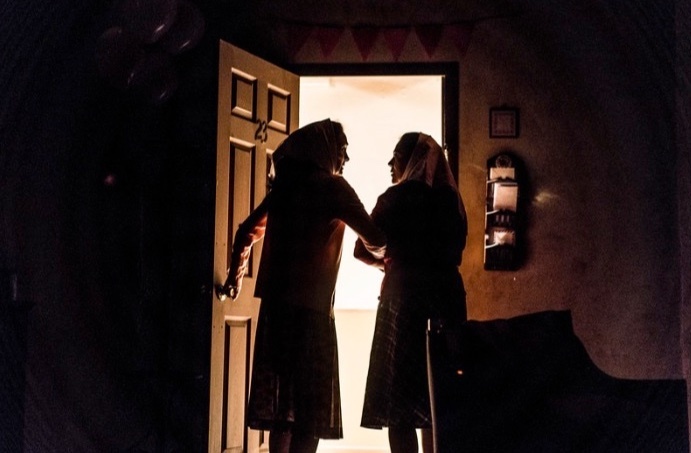 Moxie’s “The Madres” Opens Another Door Into ‘Man’s Inhumanity Toward Man’. Moxie Theatre’s mission statement is “ to create more diverse and honest images of women for our culture using the intimate art of theatre. By producing works by female playwrights and giving special attention to plays that defy female stereotypes”. Indeed, Moxie Theatre has scored a homerun with the telling of Stephanie Alison Walker’s “The Madres” now on stage through June 10th at their intimate space in Rolando. It is a gut wrenching account of three generations of women caught in the crossfires of Argentina’s ‘dirty war” (State Terrorism) from 1974-1983 to (according to the authorities) weed out the liberals, subversives and strengthening ‘love of country’. To bring unity to the people…about becoming stronger and …more one.’ Another way of putting it would be forced conformity of the National Reorganization Process. The war lasted seven years and in that time over 30,000 students disappeared in prisons (think ‘camps’) pregnant women were killed after childbirth and military families adopted their children. 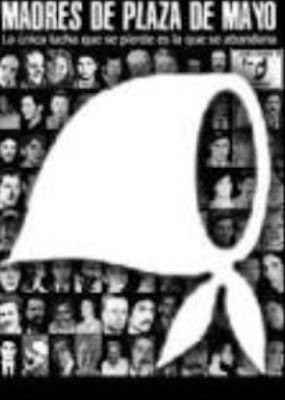 “The (Las) Madres” were the first who refused to be silenced, the first to stand up and march, the first to demand justice and the first to speak the truth about their missing children. They were the mothers, wearing white scarfs with their daughter’s names embroidered on them and marched every Thursday in front of the Casa Rosada to speak out about and demanding justice for their missing children mostly teenagers held captive by the military. Those missing were called “Desaparecida” or the disappeared. “The Madres” marks the first time Moxie has been distinguished by National New Play Network. It is now in a Rolling World Premiere that’s just custom made for the Moxies and fits neatly into their mission statement. 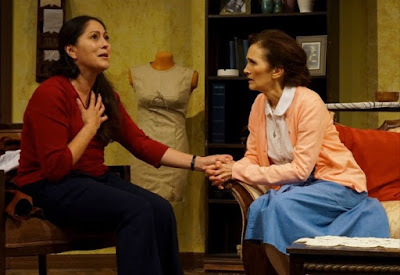 Set in Buenos Aires, Argentina 1979 in a modest flat (Alondra Vélez) Carolina (Sandra Ruiz) and her mother Josefina (Maria Gonzaléz) await the return of Carolina’s pregnant daughter and Josefina’s granddaughter, whom they both suspect is one of the Desaparecida’s or disappeared. Carolina is out this Thursday marching when Padre Juan (John Padilla) pays a visit to check up on the family and in particular his old friend Josefina. They have not seen each other in five years. Small talk ensues when we finally learn that the Padre is here for information and a warning. Unspoken of course, but intimidating nonetheless the conversation turns to Carolina and Las Madres and her granddaughter Belén (Laura Jimenez). 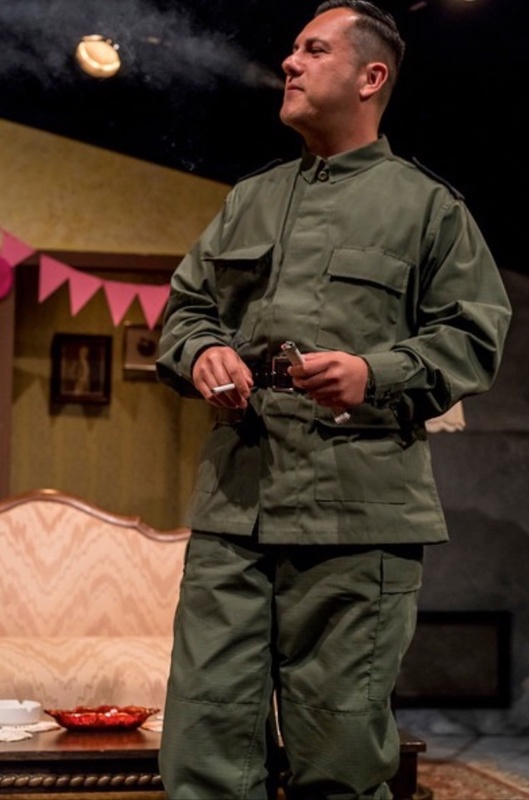 Following that visit, Belén’s longtime school friend, Diego (a smug and self- righteous Marquz Rodrigez), now a well trained, but young and naïve soldier, makes a house call that on the surface seems friendly enough, but ratchets up the anti with questions about Belén; her whereabouts and reminders that what is happening in their country right now is for the best. Co directors Maria Patrice Amon and Jen Eve Thorn, together with a well balanced cast of strong, resilient yet vulnerable women telling their story from their own perspective as they play a cat and mouse game with the men in their lives that dominate them. Maria Gonzaléz’ Josefina is as convincing a grandmother as one could expect under the circumstances. Afraid to make anyone angry that her granddaughter might be harmed, she soft shoes around answering questions. She also worries about both her daughter and granddaughter as she busies herself as a seamstress along with her keeping house and baking favorite pastries’ and offering them to each visitor. Looking rather fragile, she is the pretty much the soldier if you will, on the front lines who redirects any flack away from both daughter and granddaughter. Her ‘story’ is that Belén has left for France and she’s sticking to it. Talented, persuasive and versatile Sandra Ruiz plays Carolina with the intensity of a mother hen surrounding the wagons looking out for her offspring. She goes out every Thursday and marches worrying her mother Josefina. Their interplay is interesting to watch as both struggle to gain the high ground regarding Carolina’s activities. When the conversation bounces back to Belén its enough to break your heart knowing that, yes, she can march but she still doesn’t know if her daughter is alive or dead. 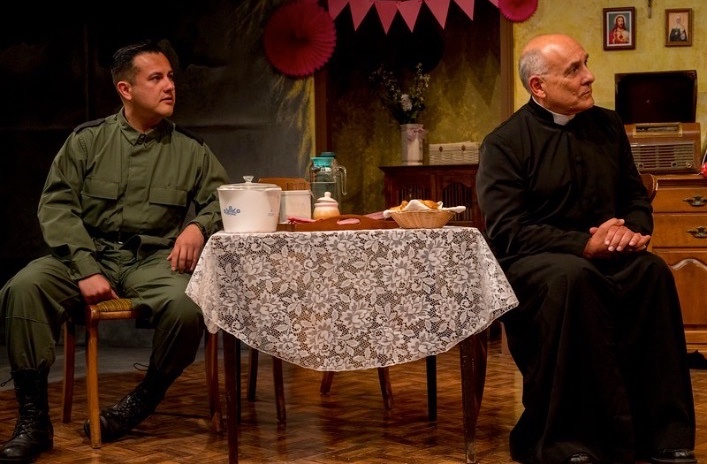 John Padilla is perfect as Padre Juan another victim caught in the crosshairs between offering counseling to those in need and satisfying the repressive government demands to get information and bring it back to the authorities. Looking troubled and pleased at the same time as when his good friend Josefina reminds him of their past friendship and suggesting a romance there somewhare. Unfortunately he offers nothing to the outcome of the crisis. His is a no win situation almost a tease for us to expect some form of help from the clergy. There are a few light moments in Act II when Josefina convinces Carolina to throw a baby shower for Belén thinking that that may be the only way to know if the girl is still alive is to invite all their friends. Both Padre and Diego show up and play some party games, both looking silly. But when Diego brings Desaparecida through the door of Carolina’s house, a hush falls over the theatre as Laura Jimenez, ready to drop her baby any minute and looking as if her face hadn’t seen the sun in months, walks through to the living room and just about collapses. If you can read body language, which you will, you will know that all is not as is it is looks be under the glaring eyes of Diego. Creative support comes from costume designer Danita Lee, Alex Crocker-Larkness, lighting, Haley Wolf, sound and of course Brava to Playwright Stephanie Alison Walker for educating so many of us in this revealing and mind blowing experience. The Madres is just one of many revealing looks into ‘Man’s inhumanity toward man’.